LeBron in his second stint with the Cavs. LeBron Raymone James (born December 30, 1984) is an NBA small forward for the Los Angeles Lakers. 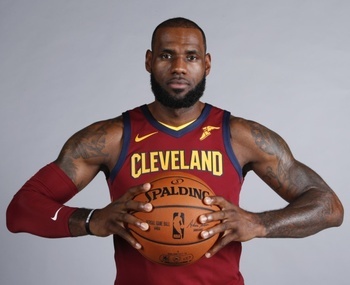 Considered to be the face of the league since at least the start of the 2010s, LeBron is the holder of three NBA championships and four NBA MVP awards. With numerous other awards such as three NBA Finals MVP awards, an NBA scoring title, selection to the NBA All-Star game in all but one of his fifteen years in the league, a Rookie of the Year award, and two Olympic Gold Medals, he is considered by many to be the greatest basketball player since Michael Jordan (and some will argue that he's superior to Jordan). The Ace: Considered to be one for the Cavaliers, especially in the 2017-2018 season where the Cavs had issues due to roster changes. Took it to another level when the media and the fans seriously started to consider that he might be better than Michael Jordan, who is by far the consensus best player in NBA history. He mostly earned this distinction by winning his conference eight years in a row, with two different teams (Miami and Cleveland); only one other player has accomplished such a feat while also being a league MVP (Bill Russell did so 10 times from 1957-66, all with the same Boston Celtics team). Always Someone Better: Michael Jordan is this to him. While it's debatable who is the better player, Jordan has the accolades to back him up, winning as many Finals as LeBron has lost. LeBron himself has stated that his main motivation is to catch "the ghost [who] played in Chicago". Arch-Enemy: Stephen Curry. The rivalry practically writes itself. As if it's not enough that James' Cavaliers and Curry's Warriors are the only two teams in NBA history to meet in four consecutive Finals series (no other pair of teams has done it more than twice), James and Curry are almost the complete antithesis of one another as players. Curry is a masterful shooter who, by NBA standards, is nothing special physically and relies on scoring from the outside. LeBron is arguably the most physically gifted NBA player of all time who scores primarily at the rim. Easily Forgiven: When LeBron left his hometown Cleveland Cavaliers to join the Miami Heat in the summer of 2010, just about the entire city felt betrayed and LeBron became an instant villain, as well as arguably the most hated sports figure in Cleveland's history (his only competition being Art Modell ). Fans burned his memorabilia in protest and anguish, his murals in Cleveland were either removed, defaced, or both, and his presence at the Cavaliers' home arena elicited "Roman Reigns the day after he retired The Undertaker" levels of boos and fan vitriol, plus the need for increased security personnel. When he became a free agent in 2014, however, and declared that he was "coming home", he was welcomed with open arms, and remains beloved in his home town, especially after bringing an NBA championship to the title-deprived Clevelandnote (the city had won no championships in any major pro sport since 1964's Cleveland Browns, a drought of over 52 years) in 2016. In 2018 when he once again became a free agent and then signed with the Los Angeles Lakers fans were left sad but not angered, thanking him for leading the Cavaliers to four consecutive Finals appearances and one championship, Cleveland's first in over 50 years. Fandom Rivalry: Fans of LeBron James and fans of Michael Jordan will probably never settle the debate on which player is greater. Supporters of Jordan will point to the fact that Jordan has more rings and has a perfect record in the Finals, and also that Jordan was more clutch. Fans of LeBron will say that he is the more versatile and better athlete, and that he led nine teams to the NBA Finals, where he was inauspiciously matched up against historically great teams like the Golden State Warriors. His fandom clashed with Kobe Bryant's in the late 2000s/early 2010s, particularly before LeBron started to win championships and established himself as one of the best players to ever touch a basketball. Lightning Bruiser: LeBron moves his 6'8, 260-pound body like a tank with turbo boosters. Of the ten players on the floor at a given moment, there's always a chance that LeBron is both the strongest and the fastest player on the court at the same time. Spotlight-Stealing Squad: Almost every article, analysis or discussion even remotely related to the Cleveland Cavaliers during LeBron's time playing with them had LeBron as the main subject (Like: "How will the Celtics beat LeBron? ").